Middle Market M&A activity was strong in 2017 driven in part, by an optimistic financial outlook following the 2016 election. This optimism positively fueled Strategic and Private Equity buyers into recognizing value and growth opportunity in middle market companies and was the catalyst for them to invest. 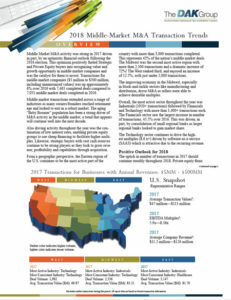 Transactions for middle-market companies ($5 million to $500 million, including unannounced values) was up approximately 6% over 2016 with 7,465 completed deals compared to 7,051 middle market deals completed in 2016. Middle market transactions extended across a range of industries as many owners/founders reached retirement age and looked to exit in a robust market. The aging “Baby Boomer” population has been a strong driver of M&A activity in the middle market, a trend that appears will continue well into the next decade.